Take an early morning walk in the Botanical Gardens at Asheville, right next to the campus of UNC Asheville. A short and easy half-mile trail takes you over bridges and through the woods to a wildflower meadow. The garden is filled with numerous species, specially focused on those native to the Southern Appalachian Mountains, with small black labels telling you what each is - there are over 600 species of plants, shrubs, trees, flowers, ferns, lichens and mosses, including 50 that are considered rare, in the 10-acre preserve. There are also many benches and places to reflect, and an early morning meditation next to the bubbling creek is a great way to start your day. Follow yoru walk in the Botanical gardens with breakfast at Homegrown, located at 371 Merrimon Avenue (they also have a location in West Asheville). They serve good, clean, local food for breakfast, lunch and dinner. Try the 'Open Face Fried Chicken Biscuit w/ Sausage Gravy, Huevos Rancheros w/ Cheesy Grits, or the Sunshine Bowl. Homegrown is a ‘certified green restaurant’ - they use solar panels, compostable takeout containers and also compost almost everything from the kitchen. Plus, their food is amazing. They do get busy, and if you go at peak breakfast or lunch time you may find a line, but the food comes out quick once you order, the herbal iced tea is really good (they serve beer and wine as well). 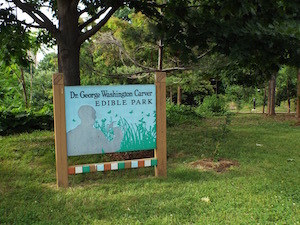 On the edge of the parking lot of Stephens Lee Recreation Center and you’ll find the Dr. George Washington Carver Edible Park, a secret garden for even most Asheville locals. This city park was the first Edible park on the east coast, and has over 40 fruit and nut trees that are open to the public for picking and eating. Handmade signs denote the edible plants that are strewn along the walk ways, with City Hall and the Asheville skyline visible just over their leafy tops. Open 11:30-9 Monday, Wednesday and Thursday, later on Weekends (closed Tuesday). Laughing Seed has been serving organic, local, and farm-to-table vegetarian cuisine with an international flair downtown Asheville for over 20 years. Even carnivores can find something delicious here from sandwiches to salads to entrees. They also have live juices, smoothies, specialty cocktails, mocktails, and kombucha, along with wine, sake, and local beers. Tucked into the historic Burton Street neighborhood in West Asheville, the Burton Street Community Peace Garden has been growing produce and uniting the neighbors for over 15 years. But this isn’t just a garden - it is also a sculpture park of found and reused items, along with an art museum, hung with key figures in black history. Walking through the park is a thoughtful meditation on where we’ve been and a hopeful look into the beauty of the future we can create. Select evening, now through October 7th, 2018, the Biltmore Estate opens the house and gardens Thursday through Sunday nights for special reservations-only viewing of Chihuly’s stunning large-scale glass sculptures. Dramatic nighttime lighting has been installed to illuminate the luminous colors and graceful forms of Chihuly’s sculptures. Live music, beautiful sunsets and a wine bar make this extra magical. With admission you can also tour the first floor of the Biltmore House, and you get daytime admission to the entire estate as well (including Antler Village and winery which offers complimentary tastings), good for the same day or the following day. Tickets are $70-$85, with discounts available. Explore Asheville with Travlavl and let us help you discover everything this mountain city has to offer!